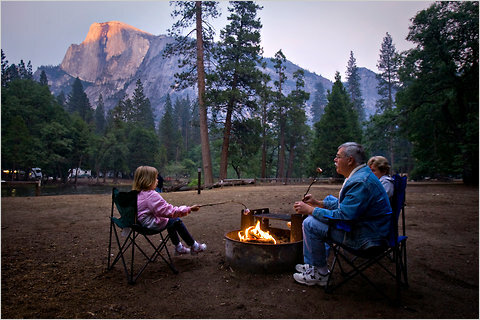 Peter DaSilva for The New York Times Campers roast marshmallows at the Lower Pines camp site in Yosemite National Park. As the deadline nears for Congressional leaders to reach an agreement on the federal budget, travelers should prepare themselves for possible closures and cancellations in the event of a government shutdown. Here’s a list of what travelers should know about services, events and closures. Passport offices will be closed for the acceptance of new applications. Limited services, such as emergency passports, will be provided. For those who need an emergency passport, contact the National Passport Information Center (877-487-2778) for assistance. Up-to-date information will be provided on the U.S. State Department Web site. “Passport Day,” an annual event during which U.S. citizens can receive passport services without an appointment, was scheduled for Saturday, April 9, but has been canceled. The National Park system, which receives more than 800,000 visitors a day, will close its doors, access roads and lookout points at midnight on Friday. All 394 national parks and 582 national landmarks will be closed, including monuments and memorials, including the Thomas Jefferson Memorial in Washington, D.C., and the Gateway Arch in St. Louis. Civil War sites and heritage locations operated by the National Park Service will also be closed. Educational programs, visitor centers and facilities will also be closed. The National Park Service Web site will be shut down, baring access to the site’s educational information, online booking and travel planning tools. Visitors staying on park campgrounds and hotels will have until 6 p.m. on Monday, April 11, to vacate park property. There are about 375 major upcoming events planned throughout the park system, said David Barna, chief spokesman for the National Park Service. If the federal government closes, all of the events will be canceled. Among the events planned include the 150th commemoration of the beginning of the Civil War at Fort Sumter National Park on Tuesday, April 12. The Smithsonian’s 19 museums and galleries in Washington, D.C., and New York City, and the National Zoo, will be closed to visitors. Care for animals will be maintained at the zoo. More information about closings will be available on the Smithsonian’s Web site, said Linda St. Thomas, the organization’s chief spokesperson. Essential government services, such as those provided by the Transportation Security Administration, air traffic control and border patrol, will remain open. Up-to-date information about budget negotiations can be found here.